In-progress buried in the snow in Fog valley. Thread: buried in the snow in Fog valley. buried in the snow in Fog valley. stuck out in dog valley still. now it's an FJ and a 4dr jeep. we're both buried to the bellies in the soft snow. from Verdi up over summit Half way between the bottom of the hill and crystal campgrounds. need some major help. might have to start hickok my daughter out toward Verdi soon. thanks. Last edited by BAMCIS; 4 Weeks Ago at 06:38 AM. starting the hike out. it will have to be an early morning rescue for the rigs. gaya let the snow freeze. So you went in from the Verdi side? I thought dude was stuck on the boardertown side? Can you drop a pin? FJ cruiser? JK? What size tires? yep we came in from Verdi. 35s on the FJ. 31s and chains on the JK. 100' winch in the Jk. the snow is still super soft. we should've come out early in the morning while everything is still frozen. My phone won't give me a point. here's the grid. Are you unable to winch to anything? I'm trying to come up with some help for you. Did you make it back to safety? we made the hike and are safe and sound. we are on a section that got too soft on the sun and surrounded by water. we actually got the FJ unstuck but the jeep was in the way. there's about 2 -3 foot of snow on the road. our bellies are on the snow and our tires are not touching gravel yet. the only way i made it to the FJ today is because of the snowcat tracks on the road. they had it packed just enough. Once i stopped the wheels sunk in fast. How low did you air down? What recovery gear do you have? How much cable or chain, any straps? Do you have traction mats of any kind? It's only going to be 29 tonight. That won't freeze too hard and you better be up there early or it will thaw out by 10:00. I'd come help but we already have other plans that I can't get out of. Some people are as useful as a football bat. Just saw your post. Free tomorrow. Let me know if i can help. Tj on 33's with winch and recovery gear. There is a Facebook page that has several people capable of going if you guys get with them. I know you are busy but if you want help, or you've got it handled, let some people know. The location of the rigs is already public so I wouldn't waste a lot of time. thanks for the info. Waiting for the group to accept as a member so I can reply to that post. thanks to everyone for the posts and offers of help. Sorry about not giving any updates after we hiked out. Right now my only plan is to get out there early in the morning. I couldn't quite make it out early enough today. If anyone is available for an early morning ride this week let me know as soon as possible. Thanks a lot everybody. Updat: Right now I'm working with one other individual to set up a Monday night operation past midnight. Once that is confirmed I will update again. 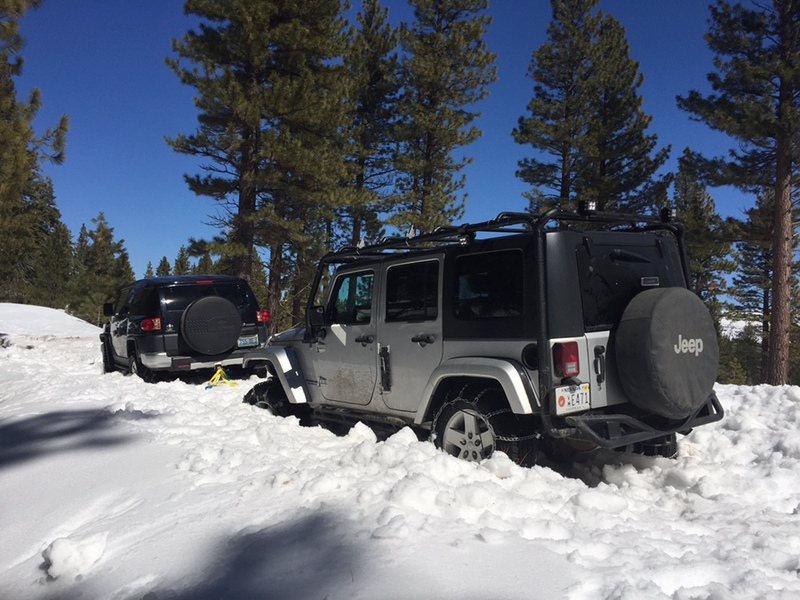 Thanks to everyone who has been contacting me and offering help through this forum, the Nevada 4x4 rescue facebook group and the handful of texts. I'm doing my best to stay on top of reponsding so I appreciate everyone's patience. Thanks again. This is why I get fat and hibernate all winter I'd offer to come lend a hand but I'd probably run out of rig as well from the sounds of it. Hoping for a successful recovery of two unmolested rigs. Good luck! BAMCIS is a motivated Marine. I owe him one. Thanks, but don't give me too much credit. Also, the real hero's are Jeff and his buddy who drove over from Sac for an early morning recovery. Thanks to everyone who pointed me toward the resources available so we could find the right people with the right schedule to pull it off! Trail Run Dog Valley - Boca snow fun? All times are GMT -8. The time now is 05:13 AM.